KUALA LUMPUR, Malaysia, 28 March 2019 – Sime Darby Auto Connexion (SDAC), the sole distributor of Ford in Malaysia, today announced its participation in the upcoming Carsifu Auto Show 2019 at Mid Valley Megamall from 3 to 7 April 2019, featuring the Ranger Raptor and Ranger Wildtrak. Visitors to the Ford stand will be among the first in Malaysia to view the Ranger Raptor in the new Absolute Black colour. Beginning April, the Raptor will be available in two new body paints – Arctic White and Absolute Black, adding to the current Lightning Blue and Conquer Grey lineup. 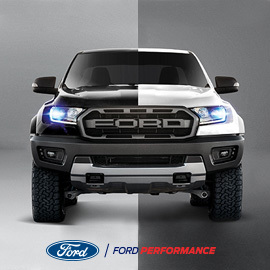 The Ranger Raptor, Malaysia’s first and only premium performance pickup, comes equipped with FOX Racing Shox dampers which deliver 30% more wheel travel compared to Ranger, and is calibrated to tackle tough terrains at top speeds. Also on display at the show is the new generation Ranger Wildtrak. Like the Raptor, the Wildtrak 4x4 variant features Ford’s 2.0L Bi-Turbo diesel engine, the smallest and most powerful engine in the market for a pickup – delivering 213PS and 500Nm of torque. It is also coupled with an advanced 10-speed automatic transmission to bring greater torque, improved flexibility and a quieter, more comfortable drive. The Wildtrak also boasts many first and only in-class driver-assist technologies including Semi-Automatic Parallel Parking (SAPP) for hassle-free parking in narrow city streets, Autonomous Emergency Breaking (AEB) system, which detects pedestrians and vehicles to help mitigate collisions, Easy Lift Tailgate, Forward Collision Warning, Lane Departure Warning and Adaptive Cruise Control. Both the Raptor and Wildtrak comes equipped with Ford’s fully integrated, voice activation SYNC® 3 infotainment system. Compatible with Apple CarPlay and Android Auto, its 8.0-inch full colour touchscreen also features an in-built satellite navigation system. Visitors to the Carsifu Auto Show 2019 will receive special only offers. Customers who book the Ranger Raptor will each receive a limited edited Ranger Raptor bomber jacket and Car Air Purifier, while up to RM6,000 cash rebate will be offered for the Ranger Wildtrak.